We are very excited to announce that August marks our 15th year as Bella Mia LLC! Our time as a business in this community is a testament to the amazing support of those who choose to shop small and keep us going! Thank you! Our gratitude extends beyond just your financial support but also to a personal level in that you’ve shared who you are, challenged us in ways that have made us grow and learn and always made Bella Mia feel like a part of the heart of Plymouth. We are a store that seeks to connect with others through fashion and through the years we’ve been fortunate enough to be able to do this together and alongside the phenomenal individuals that make up our staff. While on the surface our common denominator might be a love of style, underneath we all have a passion to genuinely connect with you- the customer. We are humbled and thankful—You are the reason we do this! Just a small token on our appreciation - the remainder of August we are offering 15% off* storewide for all our guests. 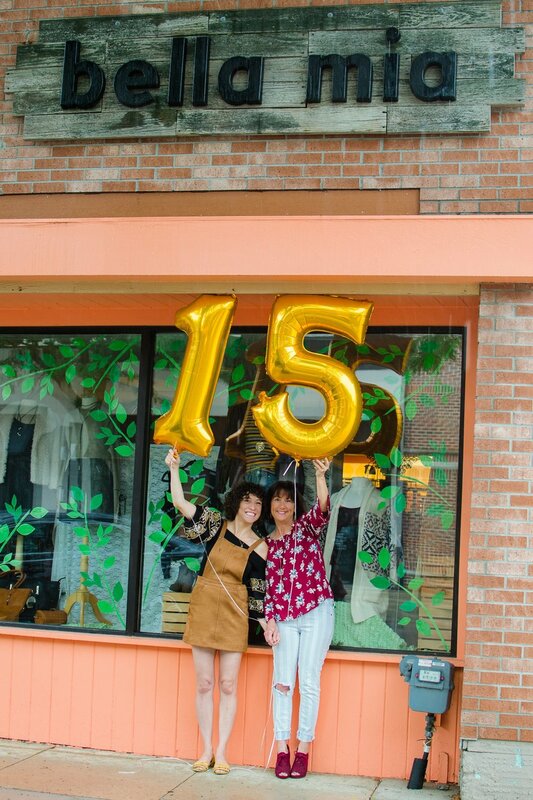 We are honored you have made us your neighborhood boutique for a decade and a half and look forward to more years of friendship and shopping together. See you in stores soon! *Discount cannot be used retroactively. Discount valid Tuesday, August 21, 2018 until August 31, 2018. Discount cannot be combined with other coupons and promotions. Discount excludes all formal wear.